Photo courtesy of Weatherford Fire Department. The iconic golden arches of McDonald’s seem unreachable from the parking lot of the fast food restaurant. But customers in Oklahoma got a bit closer than anyone could have imagined when the sign came crashing down on their cars. 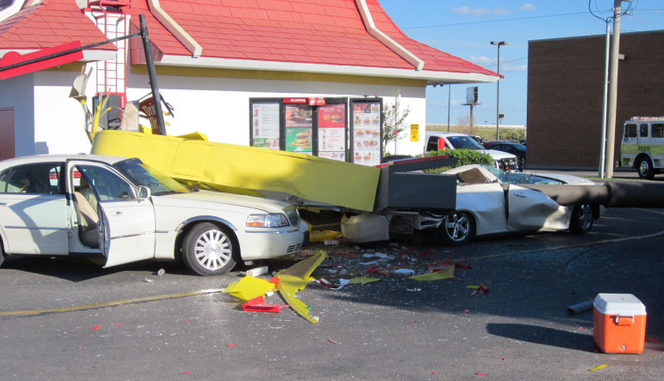 News Channel 4 KFOR in Oklahoma reports that a large McDonald’s sign fell on two vehicles in line for the drive-thru, trapping them for at least 15 minutes. . Both drivers were taken to a nearby hospital for observation, but officials say both were alert and had no obvious major injuries. Officials say things could have been significantly more tragic had passengers been in the lead vehicle. Photos from the scene show the passenger side and back seat of that car flattened by the sign. It’s unclear why the sign fell. Next What’s The Difference Between All The Many NyQuil Variations? Next Up: What’s The Difference Between All The Many NyQuil Variations?